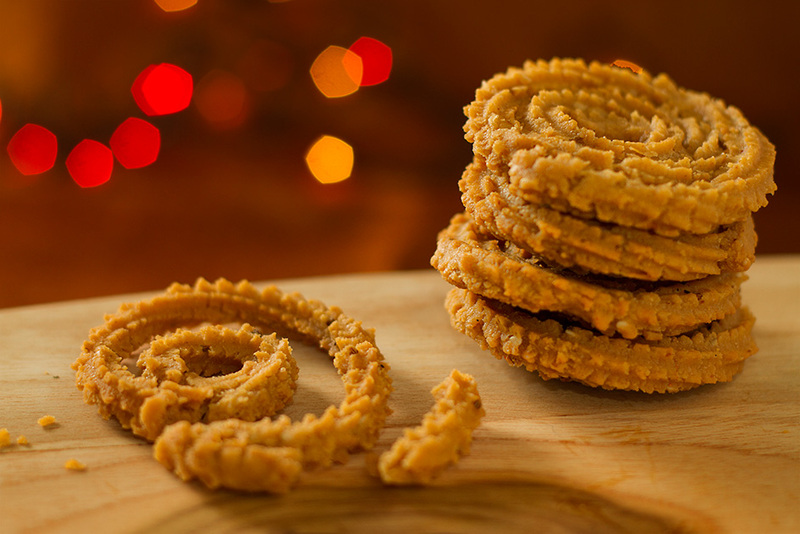 Chakli, a savoury, pretzel like deep fried snack with spiked surface is everyone’s favourite. During the festival seasons homes gets cleaned, sweets get made and along with sweets yummy savoury snacks like chakli and chiwada are made too. I often ended up eating these with my tea, basking in the morning sun. I suggest, you do the same. Dry roast rice, chana dal, urad dal, and moong dal separately till each becomes golden brown. Dry roast the poha carefully till it gets crisp. Mix them all and grind them to make the chakli flour. This flour is also available ready made in all leading stores, so you can also buy and use it. In a bowl mix 4 cups of chakli flour, red chili powder, turmeric, salt, coriander, cumin powder, salt and sesame seeds along with 2 tbsp of oil. Add warm water to it and knead it into a dough. You can keep the remaining flour in an air tight box to be used another time. Make a large dough ball and insert it in the chakli press or chakli mould. Press the dough down to make circular pattern. Make several and keep while the oil heats. Carefully lift each of them and deep fry till golden brown. After the chaklis cool down store them in an air tight container for up to a month or till they last whichever is first. This snack can be eaten hot or when it cools down. It is best served as a snack with hot tea.